It's been almost three weeks since my surgery. I'm amazed at how much better I'm feeling. I'm still easily fatigued. Any activity results in spending the next day in bed. But did you notice I managed three blog posts last week? I'm much more productive if I get out of the apartment and luckily there is a Starbucks just a block away. At this rate, I'll be caught up in no time. Today we're going back to Egypt. I've done multiple posts from that one week, but it was such an incredible experience that I can't help myself. Today I'll be showing you photos from the Karnak Temple Complex in Luxor. Just look at the scale of this place. It's massive and sprawling. There are four main temple enclosures in the complex and only one of them is open to the general public. To enter the Precinct of Amun-Re, which is the largest, you walk through the corridor of ram-sphinxes. It's like walking back in time. Our guide with Egypt Tour Portals took us as far as the entrance and shared all of his knowledge with us. You can tell he is so passionate about Egypt and its history. Again look at the scale in the photo above. This place is mind-blowing. Did you see the recent series on the BBC Two with Professor Joann Fletcher called Immortal Egypt? It was fascinating and filmed in many of the places that we visited. You can still catch three of the episodes on BBC iPlayer if you hurry. I love the way she presents her vast knowledge of Egypt. Karnak is one of the largest, if not the largest, ancient religious sites in the world and the most visited in Egypt behind the pyramids. The complex was built over a span of many years and over 30 Pharaohs contributed. It's basically a timeline of the ancient Egyptian religion. Even looking at these pictures, I'm in awe of everything that we saw. Temples, structures, monuments, statues and obelisks. Some towering overhead and some laid out on the ground. It's an incredible testament to the ancient Egyptians. It seems that most of Egypt is an open air museum. I found this particularly true in Luxor. There is so much to see even just driving down the road. It was incredible to see the pyramids outside of Cairo, but I think the Karnak Temple Complex is just as impressive. We ran into these three lovely young students and they gestured to us with their cameras. I thought they wanted us to take a photo of just them, but they wanted a photo with me. They were curious to know where I was from. Everywhere we went in Egypt we felt welcomed and found everyone to be open and friendly. The Hypostyle Hall covers an area of 50,000 square feet and has 134 gigantic columns lined up in 16 rows. 122 of the columns are 10 meters tall and 12 of them are 21 meters tall or 80 feet. The most intricate relief covers every surface. I felt like a tiny mouse in an intricate maze. I'm a bit obsessed about taking photos without people in them when I travel. But in this case I needed the fellow tourists in the photos just to show the scale. After a long day exploring Luxor it was time for the three hour drive back to Hurghada. I so vividly remember leaving the city as the call to prayer followed us out. We drove along the river though several small towns before finally reaching the desert about sunset. 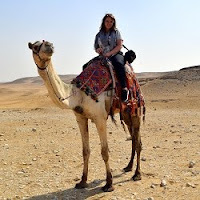 Egypt was everything that I dreamed it would be and so much more. I think I must have left a piece of myself there. Where have you left a piece of yourself on your travels?